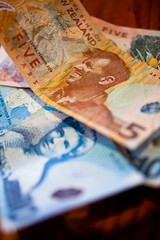 While Graham Wheeler did concede that the New Zealand dollar is currently significantly overvalued, he also said that the Reserve Bank had no simple solutions to address the issue. He said that one element which raised the value of the dollar was a series of global imbalances, such as quantitative easing policies in other countries, the low levels of interest rates available overseas, and New Zealanders’ own poor records of money saving. He went on to say that the difficulties facing the manufacturing industry are not only caused by the value of the dollar but also by the relative decline of the manufacturing sector in almost all developed economies in the world.